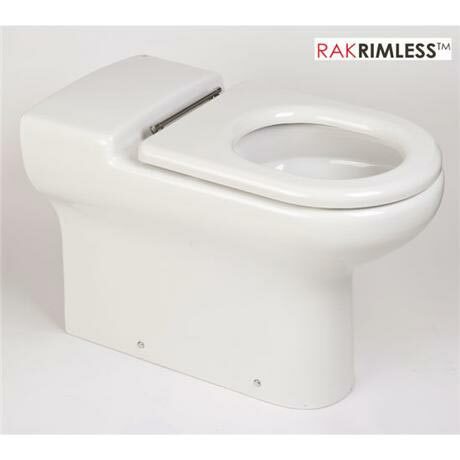 This Extended Projection Back to Wall toilet is designed and manufactured by leading brand RAK Ceramics, this toilet is part of their special needs range and is designed to be used in bathrooms were assistance may be required. This Back to Wall Pan features the latest innovation and cutting edge technology in bathroom design, Rak Rimless. RAK Rimless delivers the ultimate level of hygiene control in your bathroom, there is no hidden rim where germs, bacteria and limescale can build up. The entire surface of the toilet can be easily cleaned producing a more hygienic result. RAK strive to produce water efficient products, the rimless technology helps with cutting down on water usage, 4 litres for main flush or 2.5litres on small flush saves a third on standard toilet consumption. Please Note - This pan and seat requires a concealed/hidden cistern to be fully functional, NOT included, these are sold separately .